Hide this Project (Unitech Vista) Discover properties in other projects by hiding the ones that doesn't interest you. You won't see them in your searches further but you can unhide anytime later. Hide this Dealer (Adrija Realtors)Discover properties by other dealers by hiding those whom you have already spoken to. You won't see them in your searches further but you can unhide anytime later. Hide this Dealer (Greenix Realty Solutions)Discover properties by other dealers by hiding those whom you have already spoken to. You won't see them in your searches further but you can unhide anytime later. Hide this Dealer (Ikcon Financial Services)Discover properties by other dealers by hiding those whom you have already spoken to. You won't see them in your searches further but you can unhide anytime later. Hide this Dealer (B M Estates)Discover properties by other dealers by hiding those whom you have already spoken to. You won't see them in your searches further but you can unhide anytime later. Hide this Dealer (Santanu Sarkar) Discover properties by other dealers by hiding those whom you have already spoken to. You won't see them in your searches further but you can unhide anytime later. Hide this Dealer (avik biswas) Discover properties by other dealers by hiding those whom you have already spoken to. You won't see them in your searches further but you can unhide anytime later. Unitech Vista is a residential project developed by Unitech Group. The project offers well-designed 1BHK, 2BHK, and 3BHK apartments at very affordable prices. The project is well connected by various modes of transportation. The site is in close proximity to various civic utilities. New town is situated in east Kolkata. It is a very organized region covered with lush gardens all around. It has a very well planned infrastructure and is close to all the major roads of Kolkata. It stands close to Netaji Subhash Chandra International Airport which makes it a preferred location for the buyers. Holistic planned development is a feature of New Town. Huge stretches of the urban landscape have been earmarked to accommodate large lakes, a rowing course, golf course, outdoor recreation areas and parks, landscaped canals, urban forestry, and horticulture. It has been designed to accommodate the population and traffic growth in the years to come. What is the area of apartments in Unitech Vista? The area of apartments offered in the project ranges from 569.0 sqft to 1226.0 sqft. How much is area of 1bhk in Unitech Vista? 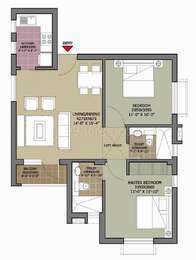 The area of 1BHK units in the project is 569.0 sqft. 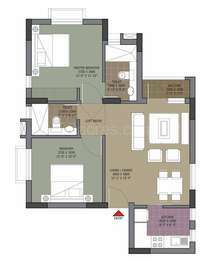 How much is area of 2bhk in Unitech Vista? Two-room units (2BHK) in the project are available in an area of 915.0 sqft to 957.0 sqft. What is size of 3 bhk in Unitech Vista? 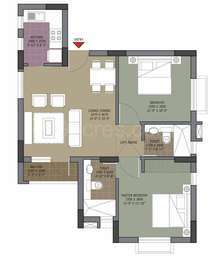 The area of 3 BHK apartments is 1226.0 sqft. What is total size of Unitech Vista?The project is built over an area of 9.0 Acres. aficionados. The projects developed by Unitech Developers successfully address the needs of the wide range of diverse audiences. Unitech has partnered long with time back with international design consultants and architects across countries like US, Hong Kong, France and UK. Its commercial and hospitality projects are equally at par with the residential projects; since the organization is also an investment company, they offers fixed deposit investments schemes that you can avail. Unitech builders are one of biggest real estate developer in the country and is also already into several joint ventures.